Very elegant church, with north-west tower, and a "considerable amount of contemporary stained glass", and now a Listed Building - see the British Listed Buildings website for more details. Next door, to the left (east) of the church, there is a much older building which was the former Wesleyan Methodist Chapel; but now in secular use. Townend Methodist Church, Chapel en le Frith shown on a Google Map. I have found many websites of use whilst compiling the information for this database. Here are some which deserve mention as being of special interest for Chapel en le Frith, and perhaps to Local History and Places of Worship as a whole. Information last updated on 18 Nov 2010 at 19:32. 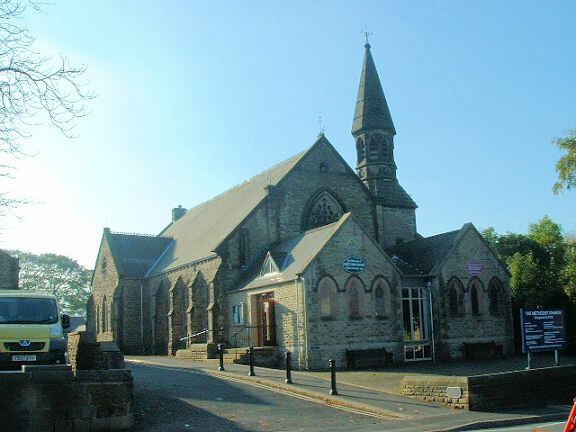 Please also remember that whilst the above account may suggest that Townend Methodist Church remains open and accessible, this may not remain so. This Report was created 19 Apr 2019 - 09:35:15 BST from information held in the Derbyshire section of the Places of Worship Database. This was last updated on 6 Feb 2019 at 15:49.